The integrity of an earthing system is critical to its effectiveness as the prime reliability and safety mechanism of an electrical installation. Measuring the electrical continuity of earthing conductors in a power installation, such as a high voltage (HV) substation, is a necessary verification test of the earthing system condition. The difference between an effective and ineffective earth connection could be as small as a few mΩ. A 1kA fault through a 10mΩ joint results in 10kW of heat, which could immediately destroy the connection, and result in an extremely hazardous scenario. The CS3 is a milli-ohmmeter which measures the DC resistance between a main earthing point and other metallic structures in an installation, enabling integrity testing four times faster than traditional methods. It has the unique capability of overcoming electrical noise, yet still providing continuity measurements within an in-service earthing system. It is now possible to detect potentially compromised earth connections in an efficient, cost-effective way. The award-winning CS3 represents the culmination of years of research and experience. 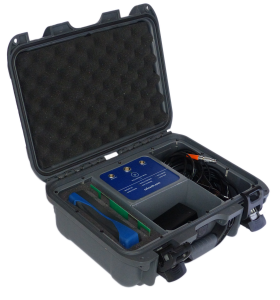 Safearth has developed the CS3 to meet needs of earthing system installers, in-service inspectors and testers. or visit the Contact Us page for more info.